Beginning in 2016, this site is now maintained by Allie Nelson, Geothermal News and Communications Specialist for the Geothermal Energy Association. This WordPress site was created, written and maintained by Leslie Blodgett for the Geothermal Energy Association from 2013-2015. The Geothermal Energy Association (GEA) is a trade association comprised of U.S. companies who support the expanded use of geothermal energy and are developing geothermal resources worldwide for electrical power generation and direct-heat uses. Activities of the GEA include advocating for public policies that will promote the development and utilization of geothermal resources, providing a forum for the industry to discuss issues and problems, encouraging research and development to improve geothermal technologies, presenting industry views to governmental organizations, providing assistance for the export of geothermal goods and services, compiling statistical data about the geothermal industry, and conducting education and outreach projects. The GEA is the definitive voice of the geothermal industry, and membership dues provide the bulk of our support. GEA is the only trade association advocating for the U.S. geothermal industry and we actively represent the industry to a wide range of state, regional, national and international groups. With the support of our Members, GEA has been a leader in efforts seeking to modify the federal production tax credit to work better with geothermal projects. Dues start at $600/year for Small Business Membership. Visit geo-energy.org/become_member. Increase your company’s visibility in the geothermal industry by sponsoring GEA Events. Visit geo-energy.org/events. As the national trade association for the geothermal industry, the GEA creates and delivers educational events involving the full range of the geothermal industry, reflecting the dynamic growth of the geothermal market, and communicating the benefits of geothermal energy. 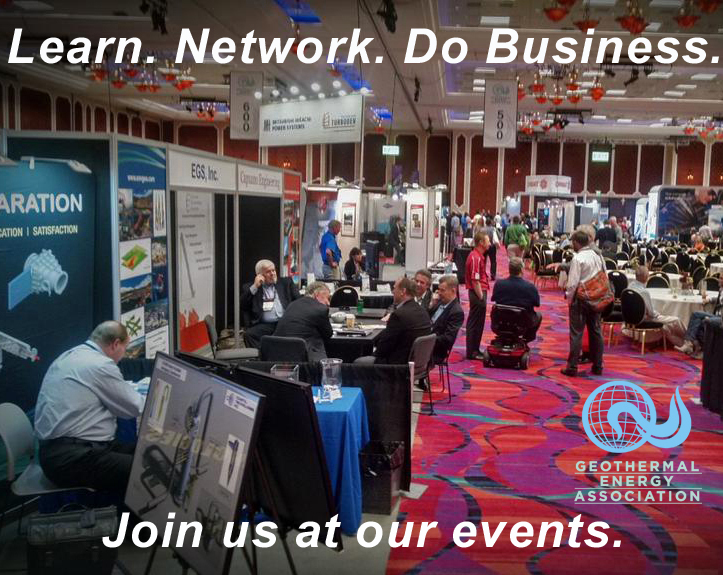 GEA events provide important opportunities to learn and network within the geothermal community as well as inform and educate companies and organizations outside today’s industry that are interested in learning more. The revenue generated from GEA events is used to advance the goal “to expand the production and use of geothermal energy in the U.S. and around the world” through future events, PR and outreach efforts, policy related activities and analysis, internet publications, and other initiatives designed to help achieve this goal. Only GEA puts your dollars to work in all of these ways to advance the future of the geothermal energy industry. GEA does not sell your email or postal address to junk mailers or spammers. Visit geo-energy.org/events.